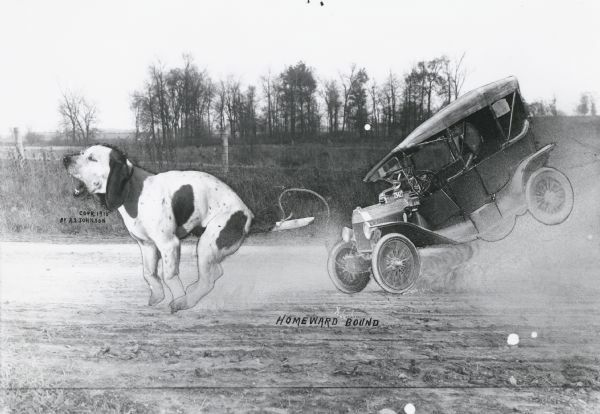 Photomontage of a giant dog pulling an automobile across a landscape. The dog is running, causing the car, which is tethered to the dog's tail by a rope, to kick up dust and fly into the air. The words, "Homeward Bound," are imprinted at the bottom of the image field. There is no one sitting in the car. This image would have been scaled down and made into a postcard. Waupun catalog no. P122. Per an email from Wystan Stevens of Ann Arbor, MI 4/16/2010: This image illustrates a visual pun. The stereotype, of course, was the mutt dog with a tin can tied to its tail -- thus cruelly tortured by nasty boys. Only, in this instance, someone has affixed not a tin can, but a "Tin Lizzie" [Model T Ford], to the pooch's caudal appendage.